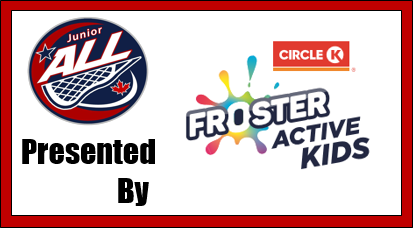 The Arena Lacrosse League (ALL) is again thrilled to have Froster Active Kids as Presenter of the Junior ALL Youth Program. "It is incredible what Froster Active Kids does in the youth community in various sports" stated ALL President Paul St. John. "To have them believe in our vision to grow winter box lacrosse and to provide us a terrific opportunity to grow the Junior ALL over the next few years is very exciting, they know that building minor sports takes times and effort." Thank you again Froster Active Kids!